Genomics has the potential to change medicine while digital genomics is taking smart analytics to next level. Like all personal information, a person’s digital genome will need to be safeguarded for privacy reasons. Personal genomic profiling has already faced challenges due to people inability for clearer understanding of their risk of genetic disease, and others – such as employers or insurance companies – might want to access and use the information for their benefits. Molecular diagnostic companies such as Myriad Genetics, Pathway Genomics, PierianDX, Color Genome, Quest Diagnostics, Rosetta Genomics, Verily Life Science and Novogene are also actively collecting genomics data from different groups of patients and launching a portfolio of clinical next-generation sequencing panels based on a proprietary digital barcoding technology. Goldstein Research analyst forecast the digital genome market size is set to reach USD 24.3 billion by 2025, at a CAGR of 8.78% over the forecast years. Increased adoption of personalized medicine and growing emphasis on sensitivity and specificity of the gene sequencing instruments have the growth potential to drive the digital genome market. The report covers the present ground scenario and the future growth prospects of the Digital Genome market for 2017-2025 along with the data of research and development projects on digital genome coupled with the investments and organizations involved worldwide. We calculated the market size and revenue share on the basis of revenue generated from major players across the globe. The Digital Genome market is forecasted on the basis of revenue analysis, product benchmarking and strategic developments of key market players. The report also includes micro and macro factors essential for the existing market players and new entrants along with detailed value chain analysis. Based on product type, sequencing and analyzing instruments accounted for over 41% of digital genome market share in 2017. Sequencing chips is the fastest growing digital genome segment at a CAGR of 9.12% over the forecast period attributed to provide innovative platform to R&D in bioinformatics, microfluidics, enzymology, and nanotechnology. Global Digital Genome Market Outlook 2017-2025, has been prepared based on an in-depth market analysis from industry experts. 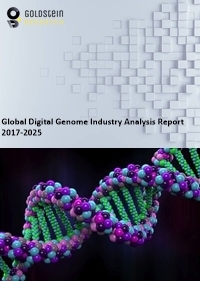 The report covers the competitive landscape and current position of major players in the global Digital Genome market. The report also includes porter’s five force model, SWOT analysis, company profiling, business strategies of market players and their business models. Global Digital Genome market report also recognizes value chain analysis to understand the cost differentiation to provide competitive advantage to the existing and new entry players. Our global Digital Genome market report comprises of the following companies as the key players: Perkin Elmer, Qiagen, Illumina, Becton Dickinson, Agilent, Sigma Aldrich, Fluidigm, Pacific Biosciences, Veracyte, Trovagene, Affymetrix, Neogen, Life Technologies, Illumina, Thermo Fisher Scientific, and Roche. According to the report, major driving factor is the adoption of digital genomics to create an intelligent enterprise and capability of digital genomics to take big leaps in digital intelligence-driven business innovation. Traditional approaches in feature detection and data prediction that use modelling and optimization are steadily being taken over by machine intelligence allowing for multiple layering of knowledge and evolved learning, ultimately leading to more accurate insight for making business decisions. Digital genomics is a key tool in developing such intelligence. Further, the report states the biggest challenge is the limited access to emerging genomic technologies or reduces their clinical impact or personal utility. Genetics community believes that translational genomic research and new forms of personalized medicine must include populations of all social, economic and racial backgrounds. Based on geography, U.S. digital genome market size accounted for over 75% of the North American revenue in 2017 attributed to successful completion of Human Genome Project (HGP) has attracted significant public and private initiatives, driving the business growth. While in 2017, Germany digital genome market size accounted for USD 1.79 billion and is projected to witness considerable growth till 2025 due to growing number of private and public investments and grants. China on the other hand, tends to witness over 10% CAGR over the forecast period owing to innovations in human genetic resources platform for creation of genomic databases and biobanks.